Their webs are loose, sticky, light gray and have no pattern. They like to hide in small dark spaces where they will not be disturbed. Initially the bite is not painful. At 2-8 hours the area will become red, tender and swollen. If left untreated, it can form a growing ulcer that does not heal and is surrounded by purple skin discoloration and swelling. Other symptoms can include: chills, fever, nausea, sweating, and itching. Severity of symptoms differ from person to person with the worst cases often involving children or the elderly. SEEK MEDICAL ATTENTION IMMEDIATELY IF YOU SUSPECT YOU HAVE BEEN BITTEN BY A BROWN RECLUSE. Put an ice pack on the area for 10 minutes, remove for 10 minutes and repeat. UNFORTUNATELY WE LIVE INSIDE THE DISTRIBUTION AREA FOR THIS POISONOUS SPIDER. IT IS IMPORTANT TO KNOW HOW TO ID THEM AND WHEN TO SEEK MEDICAL ATTENTION. 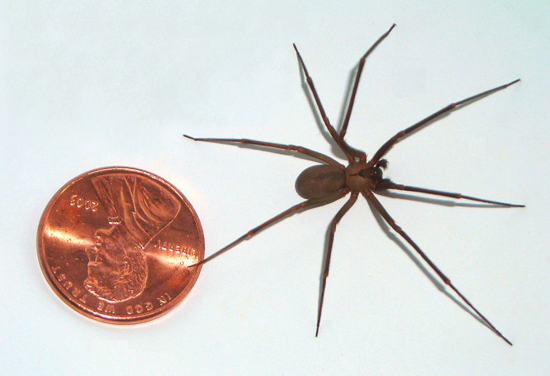 IF YOU SUSPECT YOU HAVE A BROWN RECLUSE INFESTATION IN YOUR HOME OR OFFICE, JUST GIVE US A CALL AND WE WILL SEND OUT A TECHNICIAN RIGHT AWAY.